Today, at the University of Washington in Seattle, I took time out to admire the cherry blossom trees within. And so did many others, including Sam Squirrel. Before the bushy-tailed agent of N.U.T.S scurried about on some mysterious mission, there was time to ponder the changing of Spring since the days of barely a week ago. There seemed more rain than last year, and the air a bit colder. The blossoms seemed somewhat thinner, and the trunks with more moss. What could it all mean? Perhaps nothing, Sam ruminated. The sight of it all must simply be enjoyed for as long as the peace shall last. 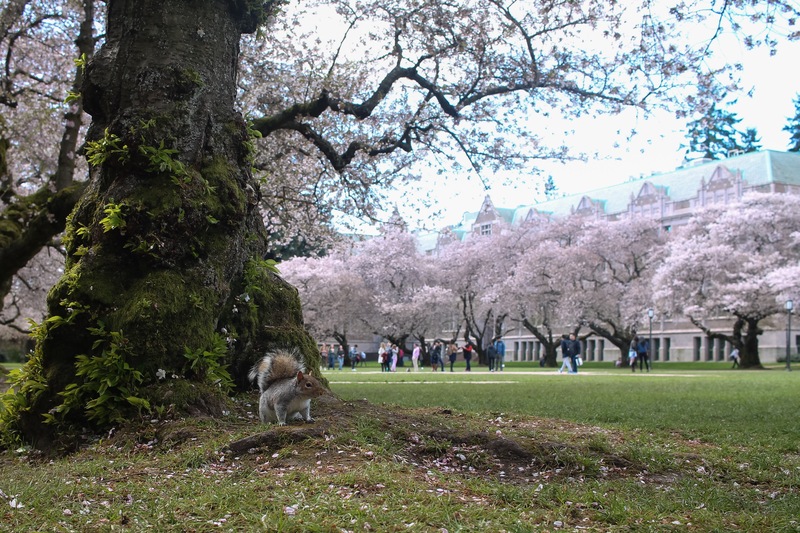 Posted on March 25, 2016 by Orion T.	This entry was posted in Nature, Photography and tagged cherry trees, nature, Photography, Seattle, squirrels. Bookmark the permalink.